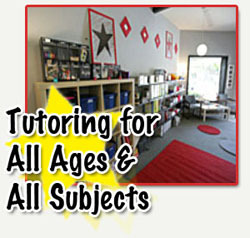 Academic Aptos is a homework-based tutoring center. We focus on individual needs to help students work through the areas in which they struggle. By tailoring our programs to compliment the student’s classroom curriculum and through teaching effective study skills, we help students improve their grades and boost their confidence. We offer subject-specific tutoring for students at any level. Students may come in to get ahead, for some extra help outside the classroom, or to catch up with material when they’ve fallen behind. Assistance with organizational and study skills is always incorporated into every session. We match students with their personal tutor based not only on their subject needs and schedule, but also on their interests and personality. We have a highly trained staff of undergraduate and graduate students who specialize in a wide variety of academic skills.